With weight loss being one of the common goals for clients, will recommending a daily visit to the scale improve their results? See what this study found. Steinberg, D.M., Bennett, G.G., Askew, S., & Tate, D.F. (2015). Weighing everyday matters: Daily weighing improves weight loss and adoption of weight control behaviors. Journal of the Academy of Nutrition and Dietetics, 115(4), 511-518. Purpose of the study: The purpose of this study was to examine whether weighing every day is associated with greater adoption of weight control behaviors compared with less frequent weighing. Study Participants: 91 Adults aged 18 to 60 who had a body mass index (BMI) of 25 to 40, with no previous medical conditions that might affect participation were used for this study. The participants were predominately from the Chapel Hill, North Carolina area and had access to the internet. The participants were randomized to a 6-month daily self-weighing intervention (experimental) or a delayed intervention (control). There were 47 participants in the self-weighing group and 44 in the control group. All participants were reassessed at 3 and 6 months. Participants averaged 43 years old, were obese, predominately white female, with a college education. Only 11% of participants reported weighing daily before the study began. The experimental group was instructed to weigh themselves daily on a provided network-connected e-scale. The scale would automatically transmit data to a website that displayed individualized graphs of weight change over time. Participants were able to view this data. In addition, data was also fed into an algorithm that was used to formulate and provide tailored feedback to each person in the experimental group weekly via email. These messages included behavior related weight-control lessons based on topics from gold standard weight loss trials and other Internet-based trials. These included evidence-based strategies, along with exercises for self-reflection and problem-solving. The control group received no intervention during the study period and was blinded to the focus on daily weighing. They received a modified version of the intervention after the 6-month study period was complete. No data other than weight was collected from this group. Results: Overall compliance of self-weighing was high: 51% weighed every day; 76% weighed more than or equal to 6 days per week, and 94% weighed at least 5 days per week. The average days weighed among the experimental group was 5.4. Weight loss was significantly greater in those that weighed daily compared to those that weighed less than 7 days per week. These daily weighers lost on average 20 lbs. at 6 months compared to only 6.8 lbs. lost by those weighing less than daily. The researchers also observed a greater reduction in BMI in those that weighed daily compared to those that weighed less than daily. Discussion: This study suggested that individuals who weigh every day achieved clinically meaningful weight loss that was significantly greater than those that weighed less often than daily. 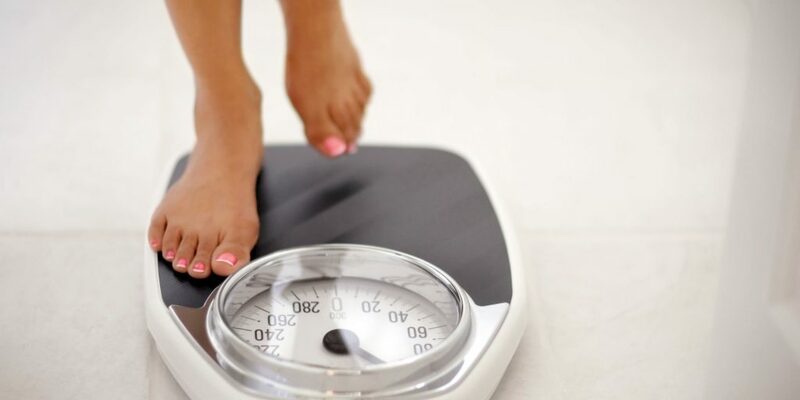 The likely reason for this difference is that daily weighers reported greater adoption of weight control behaviors than those that weighed less frequently. Thus, daily weighing may promote behavior change. This study also suggested that weighing even “most days” of the week may not be enough for optimal self-regulation. Take away for NASM-CPTs: There are three important aspects of this study the certified personal trainer needs to consider. First, there was little, if any, the emphasis placed on WHAT the subject weighed. They were not instructed to obtain a particular weight throughout the study. The participants were merely provided with their weight and tips for improving health and reducing weight. It is often taught that those seeking weight loss should not weigh too frequently as it may become discouraging. This is likely only true if the client fixates on a particular weight. Weighing every day, first thing in the morning can serve as a reminder to take healthier “steps” throughout the day. Focus on behaviors instead of a particular number. Second, regular and informative messages do make a difference. Most clients respond positively to messages with tips on how to improve. The key is that these must be received on a regular basis. In most cases, they should be motivational and suggest small behavioral changes that can be implemented immediately. It may be advantageous for personal trainers to suggest clients use a wearable device (or something similar) where data can be quickly shared. Many devices allow one to create a “network” or “group” where everyone can see each other’s data. These networks can provide continuous support towards a particular goal. Third, weighing regularly is better than not weighing at all. It is common for personal trainers to suggest a weight loss client “throw” their scale out. It is true that many fixate on a number and become frustrated. However, if the scale is positioned as a cue to a healthy behavior it is beneficial. This study suggested that those who weighed 5 days per week did better than those who didn’t weigh at all. If the number is a constant state of stress have the client cover the number with a piece of tape. Many scales these days are connected to a network and the data is automatically transmitted. The trainer can receive the data without the client having to worry about it. The key is, using it most days to cue a healthy response.